Home » What Ever Happened to Faculty Governance? Taken individually, such instances—and the faculty who complain about them—could be seen as “much ado about nothing.” But each is an example of what might be called “administrative creep”: a steady of erosion of faculty decision making in an increasingly top-down climate in which administrators call the shots while keeping an eye on the bottom line. Nor is this phenomenon unique to UMass Boston or the UMass system. In fact, as a new book documents, the tradition of shared governance on American university campuses is under siege across the country. In The Rise and Decline of Faculty Governance, Larry Gerber, professor emeritus of history at Auburn University, argues that the rise of adjunct faculty and corporate-style management threatens, not just shared governance, but the entire U.S. system of higher education. “Key questions for the future are whether current challenges to the practice of shared governance will only intensify and whether such challenges will affect the quality and purpose of American higher education,” writes Gerber. Nelson, Chu and others say that the solution to the weakening of faculty governance structure is obvious: strengthen such structures. And, thanks to a series of initiatives aimed at making the Faculty Council more responsive to the concerns of faculty members, there are encouraging signs that positive change is underway. Faculty Council Executive Committee member Heike Schotten points to a series of open meetings without any formal agenda (or any administrative presence) at which faculty can tell committee members about their concerns. Schotten, who is a faculty member in the political science department, says that Faculty Council members also have high hopes that a new investigative committee tasked with looking into autonomy in the hiring process, will transform anecdotes into data. “Faculty have come to us to say that they feel they no longer have autonomy in hiring,” says Schotten. The new committee, which was approved in October, and whose three faculty members were formerly voted on at the last Faculty Council meeting, will collect data on university hiring during the past five years. The Faculty Council also approved the creation of another committee: one that will examine the relationship between gender, minority status, service commitments, and the role of these intersecting factors in tenure and promotion. Schotten notes that both committees were created in response to faculty requests and complaints. “There’s a real concern that Faculty Council has been too passive and inactive. We’ve really been working to change that and making the Council more responsive to faculty concerns is an important first step,” says Schotten. The next open meeting of the Faculty Council will be Nov 30th from 1-3 p.m. in the Ryan Lounge. The meeting is open to faculty only. Faculty members are urged to come and bring their questions and concerns. 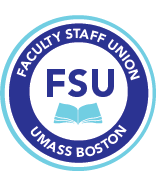 The FSU will be highlighting faculty governance issues and concerns that you identify in our spring newsletter. Please send examples of these to us at fsu@umb.edu.